New Canaan's Isabel Taben carries the ball. Having been runner-up nine times since winning the first FCIAC girls lacrosse championship in 1993, the New Canaan Rams really want to hoist that trophy and this year they may have the right group to finally break through. Standing in the Rams way are the usual suspects when it comes to girls lacrosse — Darien, Wilton and Greenwich — each of whom brings a different challenge to the table. The Blue Wave have won three straight titles but said goodbye to several All-American players, not exactly easy to replace but if anyone is up to the challenge it is Blue Wave coach Lisa Lindley. Wilton, which won titles in 2010 and 2011 also brings back a talented core of players and will not roll over and watch their rivals to the south move right in. Behind the top four, teams like Ridgefield, Staples, Danbury and Warde could make some noise but still seem years away from breaking the stranglehold the Big Four teams have on the league. 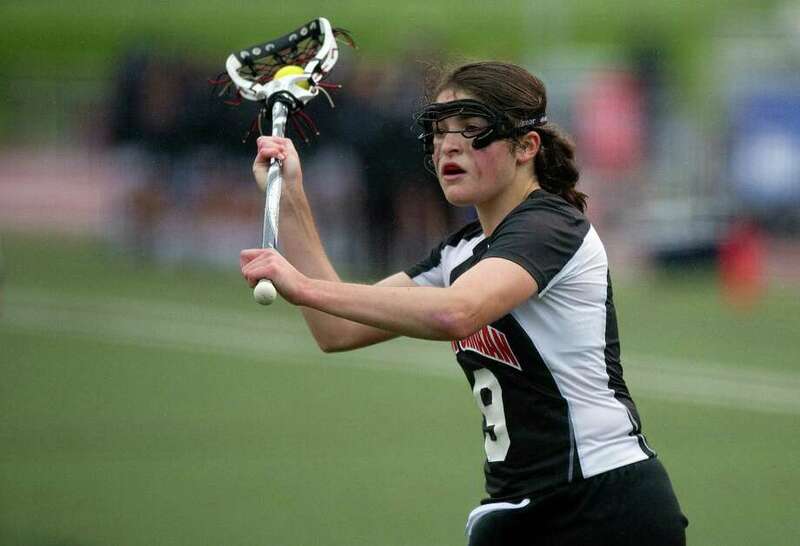 ISABEL TABEN, NEW CANAAN: The senior will lead the attack for the Rams offense. A first team All-FCIAC selection, Taben will play at Dartmouth. MARIAH MATHEIS, DARIEN: An All-State selection a season ago, the senior leads an experienced attack for the Blue Wave. ANNA MOORHEAD, DARIEN: The All-State attack is back as one of the few returning starters for the Blue Wave and will be leaned on heavily as the newcomers mesh with the returners. NATALIE PALETTA, GREENWICH: The defensive midfielder will be called on to lead the Cardinals after being named first team All-FCIAC last season. MAKENNA PEARSALL, WILTON: The dynamic midfielder will play lacrosse at Notre Dame. One of the more athletic players in the league, she is the straw that stirs the drink for the Warriors. NEW CANAAN: The Rams have not won a FCIAC title since 1993 and feel like with the talent they have returning this could be their year to retake the throne. Emily DeTour will anchor the defense while Elizabeth Miller will control things in the midfield. WILTON: The Warriors return three talented seniors Pearsall, Sara Dickinson and Cecily Freliech and will have something to say about who takes home the FCIAC hardware this season. A young but talented roster around them makes Wilton a team to be reckoned with. DARIEN: The Blue Wave may lose a game or two this season according to coach Lisa Lindley, but her hope is they are playing their best when playoff time rolls around. With players like Moorhead and Matheis being joined by Caroline Benitez on defense nobody will be — or should be — taking Darien lightly. GREENWICH: The Cardinals come in with lots of options and a deep roster with Anne Dunster and Maddy Graves up on attack and Paletta on defense and in the midfield. If the Cardinals can focus on playing as a team they could be vying for the league crown in the end. RIDGEFIELD: The Tigers only feature four seniors, but bring back eight juniors who played as sophomores, giving them experience running the FCIAC gauntlet. The Tigers have their sights set on the FCIAC playoffs and if they get in they could be capable of an upset. APRIL 15, DARIEN AT MANHASSET (NY): Connecticut’s best travels to face one of New York’s best in a great measuring stick for both teams. APRIL 18, MT. SINAI (NY) AT NEW CANAAN: The highly ranked Mt. Sinai team comes to Dunning Field for this one under the lights. MAY 7, DARIEN AT NEW CANAAN: Is this ever a bad game? MAY 12, WARDE AT RIDGEFIELD: Both teams would like a spot in the playoffs, a win here would help make that happen.